As part of this year’s Manchester International Festival, UEP co-Investigator, Abi Gilmore spoke on a panel questioning, Does Culture Need Walls? Below is the full text for her panel presentation. It was part of Interdependence, a two‑day festival of talks, performances, and inspirational thought. First thing I want to say is of course the arts and culture need venues and buildings – I feel like I have to say that, surrounded as I am on this panel, by the most powerful cultural venue leaders in Manchester, all of whom are currently benefiting from capital development and investment. It’s fantastic news that the talent, creativity and leadership skills in Manchester are rewarded by this investment – and there will be even more opportunities for presenting amazing artistic programming to the world, and making the city even more competitive and attractive place to live and work in. So now I’ve got that out of the way there are three points, which I hope contribute to this debate and which I think are connected. They are about being culturally sensitive. They concern the broader question of new buildings for culture and who and what they are for. The first point concerns participation in the arts – and whether there are different types of walls we should be talking about. The Taking Part national statistics on adult arts participation were released last week. These show a drop in the engagement of adults in the arts from 78% to 77%. This statistic is the number of people who have attended or participated in the arts at least once in the previous year. By arts they mean a broad number of activities from panto and circus to concerts and painting. The national rate been static or decreasing slightly over the last ten years, apart from the North West where it has increased by 6 percentage points. Who are the people who are engaging in the arts? Recent research cited in the Warwick Commission on the Future of Cultural Value ‘Enriching Britain’ report showed that the 8 percent most active segment of those participating are the least diverse, most affluent. Taking part statistics were developed to try to measure how arts and cultural policies increase participation, and the benefits and outcomes associated with engaging in the arts – whether that’s economic benefit or health outcomes, wellbeing or social capital. So to hear that participation isn’t going up and that those who do participate in the arts most are of a particular type must be a bit galling for policy makers and arts makers alike. As well as policy makers, arts organisations also need to know as much as possible about their existing audiences and their potential audiences, for a variety of reasons which effect artistic, business and policy outcomes. They are usually pretty good at this. Like policy makers they also want to know what stops people participating in the arts, what the other kinds of walls and boundaries there are. In the academy, we have developed some explanations from cultural studies and sociology. From Raymond Williams we know that culture is both powerful and ordinary. From Pierre Bourdieu, we understand how social groups have different levels of cultural capital, and this provides access to the knowledge and distinctions of particular taste formations and also structures the social realm (and shuts people out of certain groups and experiences). 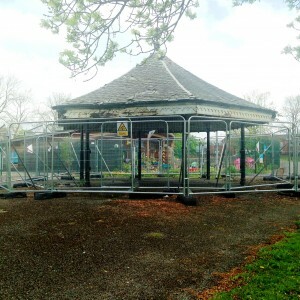 I’m part of a team led by the University of Manchester working on a five year research project funded by the Arts and Humanities Research Council as part of the Connected Communities programme. It’s on understanding everyday participation. We also want to find out how people value arts and cultural participation. We have been using mixed methods such as interviewing, ethnography, data-mining and mapping to explore what people do in their communities. However instead of asking people whether they take part or go and see the arts, we’ve been carefully avoiding any predefined definition of participation. This is because we want to avoid attaching any predefined value frameworks to different cultural activities. Some of the research has taken place in Cheetham in North Manchester and Broughton in East Salford. We’re still analysing all the different data but we have found out a number of things. It is clear that there are very many ordinary everyday things that people value, like cooking, making clothes, taking the dog and the children out for a walk in the park, playing football with friends, watching videos online and eating takeaways, which don’t show up in cultural participation and engagement statistics. Our interviewees indicate also that people don’t feel that arts venues just down the road in the city centre are places for them. The second point then is where people want to be to get their cultural value fixes. The people we speak to are not inactive but highly engaged – just not in city centre arts venues, but in parks and playing fields, shopping centres, mosques and synagogues and in their own homes. Evidence on barriers to participation suggests proximity and familiarity are key factors. There is also evidence that local community centres with multiple uses and purposes may be more likely to attract people to participate in the arts. 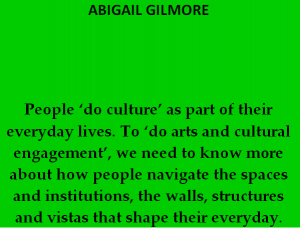 This suggests to me cultural policies that reach out to people in their own neighbourhoods and which invest in spaces and facilities within easy reach make people feel safe and comfortable. I was in Moscow recently and saw this policy in action. Moscow state minister for culture Kapkov (until he left last year) began a large programme of investment in culture houses, parks and programming in the neighbourhoods, as well as investment in improving the public realm for residents and tourists. This doesn’t sound so unusual for us, but it is for a hard city like Moscow, and the change over two years since I last visited is palpable. Manchester has an amazing library service, and an even more amazing amount of locally important parks and green spaces. Alongside the museums and art galleries, parks are historically significant cultural assets which have played a large role in the city’s cultural policies for participation. However in these times they are under threat and some may not remain public spaces for longer. 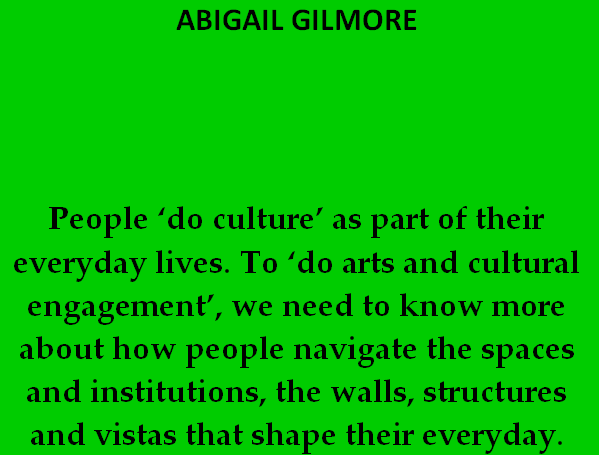 So the final issue I want to raise is concerns the priorities for cultural funding, In times of limited resources, how can we prioritise funding bricks and mortar over programmes? If it is really the case that new cultural buildings are needed, then how can we make sure that they are both civic institutions and public spaces? How can we make sure they are assets not liabilities? How can we make them cultural sensitive? 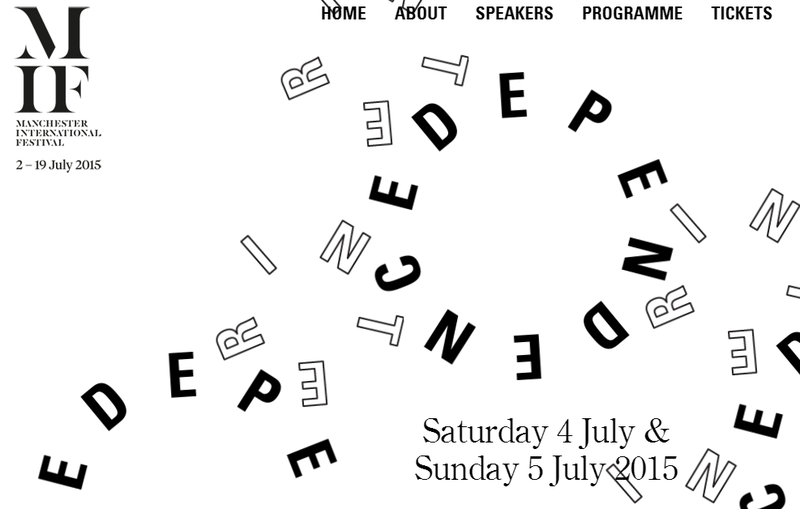 This is the full text for panel presentation given by Abigail Gilmore at the Guardian Live/Manchester International Festival event, Interdependence, 4th July 2015. The Panel was chaired by Maria Balshaw, Director of the Whitworth Art Gallery and Strategic Lead for Culture, Manchester City Council, and featured Dave Moutrey, CEO HOME, Abigail Gilmore, Azu Nwagbogu, Director of the African Artists Foundation, Lagos, Sir Howard Bernstein, Chief Executive, Manchester City Coucil, and John McGrath, incoming Director of Manchester International Festival as discussants. This entry was posted in researcher posts and tagged interdependence, manchester by Susan Oman. Bookmark the permalink.